Sunday saw me take part in my first half marathon in over 13 years, the Reading Half Marathon, and what a brilliant race it was. 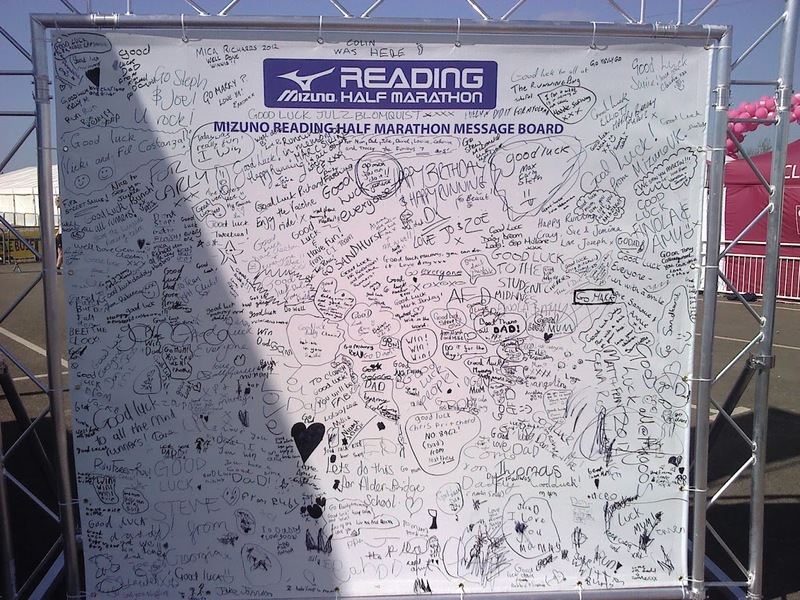 As you may have read back in November, I took the plunge and entered the Reading Half Marathon and continued with the MAF training principals exclusively with the idea I'd going into my race with at least a great aerobic base and possibly missing some speed. This was a bit of a gamble as I'd never heard anyone train like this before and had certainly never taken this approach myself. Seeing as I hadn't done a half marathon in a while, I thought "What the heck. It'll be an interesting experiment. Worst case scenario, I blow it. Best case, I finish the race strong and get the sub-90 minute finish time I'd be aiming for". Well, Sunday morning arrived and it was a glorious morning. The sun was shining, the temperature was perfect and my wife and I hopped on our bikes and took a gentle cycle to the Madejski stadium. As it's only 6.5km away from home I opted to cycle to and from the race rather than fight with the crowds on the shuttle buses or pay for parking. This proved to be a very wise choice as there were way more people about than I was expecting. It also proved to be a very good warm up, so once at the stadium, I only had a short little run to do and some dynamic stretching before making my way to the start of the race. The 30 mins I'd given myself for this turned out to be plenty. Despite this being my first half marathon in over 13 years, I didn't go for a "wing it and see" approach. I actually devised a race strategy. In order to get the sub-90 minute time I was aiming for, I decided on running a negative split, that is run the first half slower than the second. Then I went a step further and broke the race up into three 7km chunks with the aim of running each 7km chunk in a progressively faster time. 0 - 7km: 31:30 which is 4:30/km. Plenty slow enough to deal with the first hill and the inevitable slow start caused by the sheer number of runners. 7 - 14km: 30:00 which is 4:17/km. This is slightly slower than the pace I'd have to have sustained if I ran a constant pace for a sub-90. I actually planned to run this leg at about 4:16/km, the required pace, just to be safe. 30mins was an easy number to remember. 14 - 21km: 28:30 which is 4:04/km. This is quite a fast pace, but I thought I could do it, especially if my middle 7 turned out as I'd hoped and took me less than 30 minutes. Now those with an eye for maths will notice this takes me to 90mins for 21km and a half-marathon is 21.1km. Well, this was all about ease of calculation whilst on the run and with the final 100m being left out of the equation I knew I could always run like a man possessed for 100m at the end if need be 🙂 . I would however run the last 7km with the last 100m in mind anyway. The idea behind this three-way split is it would give me a good way of assessing my pace and race in conjunction with how I felt at each point of the race and I could then make any changes as I felt fit, whilst also running a negative split. As it so happens, my planning turned out brilliantly. At just after 10am we were all sent on our way. I was quite far from the start line so didn't hear the gun but registered we were off when the announcer said "And they're off" (about 15 seconds after starting the race). It took me about 1 minute 15 seconds to cross the line and then I was off in the middle of a sea of people for our 21.1km around Reading. Things start off very slowly due to the sheer number of people ahead of me, but things soon started thinning out a bit, but not much, just after the 3km. I was feeling great, enjoying the crowds and great weather and my legs just ticked over. I went through the first 7km just behind schedule in 31:36 (watch time, not gun or chip time). Not bad at all considering there were way more people than I anticipated, congestion was quite bad at the beginning and the steepest climb fell within this period. Happy with this and happy with the fact I was still feeling good, I picked up the pace a bit and ticked over the next 7km in 29:09 (1:00:45), going through the 10km mark in a chip time of 43:30. A bit quicker than I'd planned but I wasn't too concerned as this leg included a fair bit of downhill running and I was still feeling great. Happy with my second leg and a bit ahead of schedule, I stepped the pace up a bit and headed for the finish line. This last 7km was thankfully quite flat and I think it definitely helped that I knew exactly where I still had to run before getting to the finish line. With just over 2km to go we turned back into Greenpark back onto the road on which we started for a little hair-pin loop before heading into the stadium. It was about half way up the inbound part of the hair-pin that I saw the 1:30 (90 mins) chip time pacer for the first time since the start of the race and he shouted out that we still had a chance to catch him and dip under 90mins for the run. I took that as a challenge and dug in deep. I wanted to catch and pass him. So far I was more or less on track for a sub-90, but I knew if I passed him, I'd definitely do it. It was at this point I started to feel a little tired, but I ignored those feelings and pushed on and passed the pacer on Shooters Way with about 200m to go and I just kept going. That last 7km segment ended up being only slightly faster than the one before taking me 29:01 (1:29:46) and I entered the stadium and sped my way to the finish line, crossing in a gun time of 1:31:19. I was very happy with this time. I'd almost dipped below 90 mins for a gun time on a huge race. Knowing that it took me somewhere between 75 and 90 seconds to cross the start line, I was quite confident I'd dipped under 90 mins for my chip time, especially as I passed the pacer, but not overly so as I knew it would be close. I'd have to wait for the official results to get my chip time. I did the goodie bag and medal walk through and met my wife outside the stadium. I then went for a very short and gentle cool down run. I ended up cutting this short as my calves were starting to cramp so instead we jumped on our bikes and headed into town for lunch. I thought it only appropriate to take my wife out for lunch after she sat reading her Kindle in the sun in the stadium waiting for me. This cycle into town and then ultimately on to home ended up being a great cool down. 1:29:52 !!! Yes!!!! I'd done it. My racing strategy had worked perfectly, and it's just as well I didn't stick to it too closely as I don't think I'd have crept under 90 mins if my middle leg had been slower. My final position was 731 out of 13104 finishers. Job done and in my Vibram Five Fingers. I'm back to running half marathons and I've gone under the 90 minute mark. Now I've done it, it should be easier to do it again in the future. ... lead me to believe I have a sub-19 5k, sub-39 10k and sub-60 15k in my legs this season and I think I'll be using these as my goals for this season. Despite not actually getting my race number and T-shirt in the post (I'm doubtful it was even sent), this was a great race, a great route and made better by some great weather. I'll definitely be doing this race again, but maybe not next year. We'll see how it fits in with the other halves around this time and my training.